Now you can carry one tool to test all temperature sensors and transmitters in your plant. 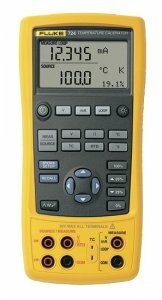 The Fluke 724 can measure and source 12 thermocouple types and seven RTD types, plus volts and ohms. The 724 even handles high-speed pulsed RTD circuits and provides loop power. The dual line measure/source display lets you source temperature and view loop current at the same time. And with its simple, "no menus" controls, the Fluke 724 is easy to operate, too.